A 1951 Ferrari 340 America Touring Barchetta and 1984 Peugeot 205 Turbo 16 Evolution 1 Group B lead early entries for RM Sotheby’s Monaco 2016 sale. The 340 America, one of the first ‘big engine’ competition Ferraris, raced at 1951 and 1952 Le Mans 24 Hours and entered in nine Mille Miglia road rallies from 1984 to 2006. The Peugeot 205 T16 is one of the most iconic and successful Group B rally cars of its era; driven by Ari Vatanen, it claimed victory at both the 1985 Monte Carlo and Swedish rally. RM Sotheby’s biennial Monaco classic car sale will be held on 14 May 2016 during the during the Grand Prix de Monaco Historique weekend. RM Sotheby’s will offer around 100 cars for sale at this one-day event. In 2014, RM Auctions grossed €41 in sales at the Monaco 2014 auction. The growing importance of the Monaco historic grand prix weekend is reflected in Bonhams planning a first Monaco auction in 2016 too with1952 Jaguar C-Type Sports Racing as lead entry. The 1951 Ferrari 340 America Touring Barchetta, chassis no. 0116/A, (estimate available upon request) is the early lead entry for RM Sotheby’s upcoming Monaco 2016 sale. Steeped in motorsport and racing provenance, the one-of-eight, Touring-bodied 340 America retains its original engine and is recognized as one of the first big block V-12 racing Ferraris. Chassis no. 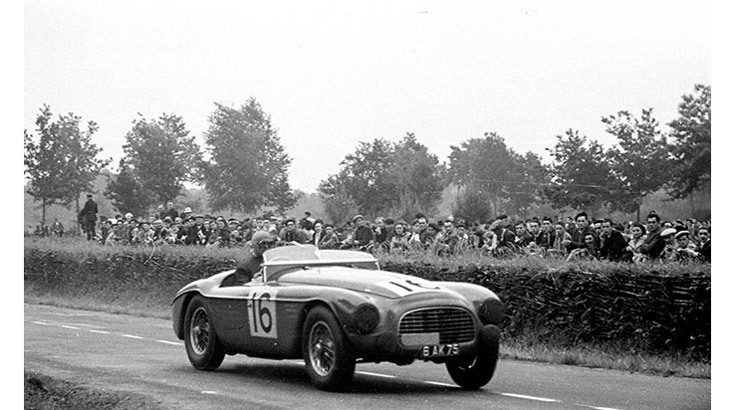 0116/A was sold new in 1951 to Pierre Louis-Dreyfus, a noted World War II hero and successful businessman, who immediately entered it in the Le Mans 24 Hours, where it was run by Ferrari’s North American Racing Team founder and successful racer, Luigi Chinetti. Driven by Dreyfus and the legendary Louis Chiron, the car enjoyed a race duel with another 340 that so engrossed Chiron that he missed his pit window and 25-lap signal. The car ran dry on circuit and was rescued by the team’s mechanic who illegally refueled the car, causing them to be black-flagged and disqualified. The 1951 Ferrari 340 America Touring Barchetta, chassis no. 0116/A, returned to Le Mans a year later with Chinetti, Louis-Dreyfus and a new team-mate Rene Dreyfus, and fought valiantly but retired with a clutch issue in the fifth hour of the race. Throughout the years, it has passed through the hands of a number of respected collectors, including Pierre Bardinon, who have enjoyed the car in numerous historic race meetings such as the Mille Miglia, as well as showcasing it at a number of concours d’elegance events. It comes to auction eligible for almost any international event. Another motorsport racing icon, a 1984 Peugeot 205 Turbo 16 Evolution 1 Group B car (est. €600.000 – €800.000) will join the Ferrari at RM Sotheby’s Monaco 2016 sale. This Peugeot 205, driven by Ari Vatanen, is one of the most iconic and successful World Rally Championship (WRC) and Group B rally cars of its era. Winning both the 1985 Monte Carlo and Swedish rally, chassis no. C11 was one of just three Works cars entered into the WRC by Peugeot Talbot Sport, from a total of 20 Works Evolution 1 rally cars ever made; its two victories helped propel Peugeot to claim the world championship that year. Vatanen also used the car to recce the Tour de Corse and Acropolis rallies later in the year, before its final outing with Bruno Saby at the Sanremo rally. The 1984 Peugeot 205 Turbo 16 Evolution 1 Group B car is offered in Monaco 2016 having had just two previous private owners, and boasting an outstanding provenance, heritage and status. See also other Monaco Sale entrants and previous results.